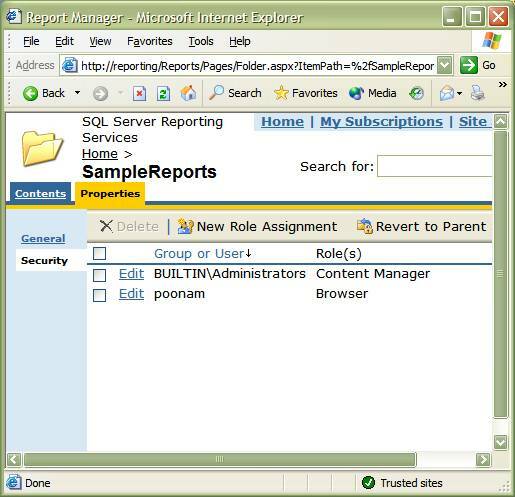 1) The Report Manager web application, where you can browse and view reports, will require Windows to authenticate all clients. 2) The only users authorized to use the Report Manager application will be members of the server’s Administrators group (BUILTIN\Administrators). If you want to get your reporting project off the ground and allow other people in your organization to view reports, you’ll need to add additional groups and users into roles. In this article, we will highlight some basic features of Reporting Services role-based security. 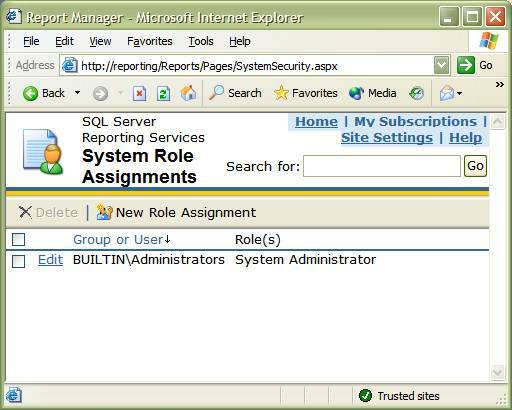 Reporting Services ships with 6 built-in roles: System Administrator, System User, Browser, Content Manager, My Reports, and Publisher. 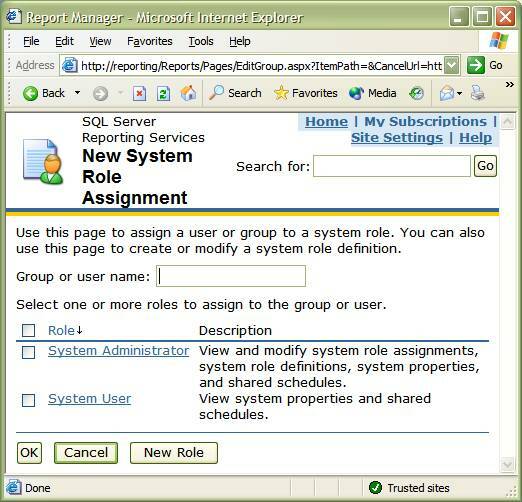 Placing a Windows user into one of these roles will give the user authorization to perform specific actions with the report manager. For example, a user in the role of Browser can view folders and reports, but not publish new reports. 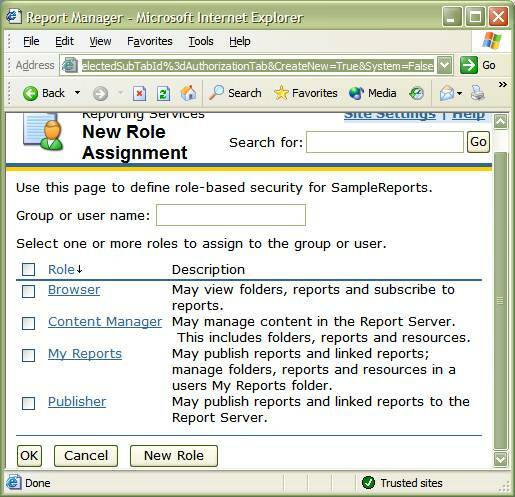 A user in the role of Publisher can create, view, and delete reports, but cannot create new roles. These are the default settings of Reporting Services, which a user in the System Administrator role can modify. As mentioned earlier, the Reporting Services setup will place the local machine’s Administrators group into the System Administrators role. Since this role is an all-powerful role, you’ll want take care with any modifications you make. A true system administrator will probably also need admin privileges on the server to take care of tasks such as starting and stopping services, so consider adding the person or group into the local administrators group of the server (but think of the ramifications first). From here you can enter a username, or a group name into the textbox. For machines in a domain, you can prefix the name with the domain name, (DOMAIN\scott, for example). Reporting Services will verify the entry, so don’t worry about spelling mistakes. Select the checkboxes for the role you want to assign. Notice you can also create a new system role, though we will not cover the topic in this article. You can select from the built-in roles shown above, or create a new role. Using the UI you can view the tasks each role has permissions to perform. The security settings you set will flow downwards, that is any folders and reports underneath the SampleReports folder will inherit these settings, so you do not need to repeat this step for each report in the folder. You can break the inheritance by defining a new security policy for a child item. I hope that this article will give you a jumpstart on managing roles for Reporting Services. I recommend you go to the official documentation for additional reading, as this article serves as only a brief introduction to role-based security in Reporting Services.